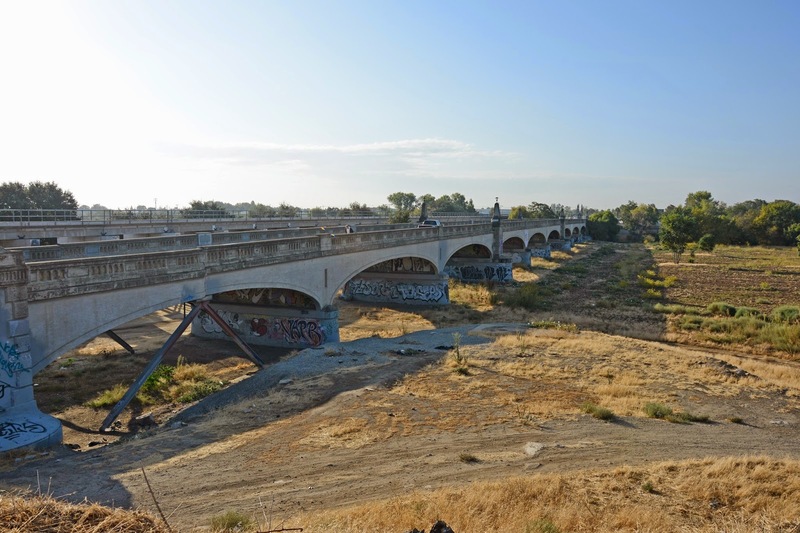 The Seventh Street Bridge (38C0023) is a 14 span, 1170 ft long closed spandrel arch that was built in 1916. It's the design of John B. Leonard who specialized in innovative concrete bridges. This structure is composed of steel truss elements encased in wet concrete. Leonard built several of them in California but this was the most impressive. The steel truss was supposed to take the place of reinforcement, but it's missing the perimeter shear and confinement steel. Anyway, the bridge appears to be having some structural problems where the truss elements meet at midspan. Stanislaus County, California Bridges: Seventh Street Bridge across the Tuolumne River (2) by Mark Yashinsky is licensed under a Creative Commons Attribution-NonCommercial-NoDerivatives 4.0 International License.